The ancient Egyptians believed eating mushrooms brought long life. While their scientific method was perhaps not entirely sound, modern scientists investigating the medicinal properties of the organism are beginning to produce some fascinating results. 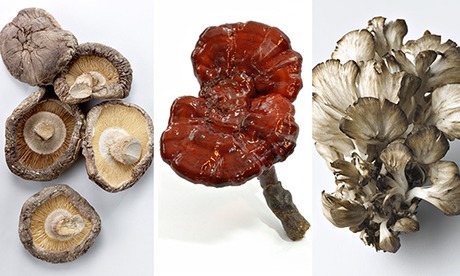 There are thousands of species of mushroom growing in the wild, but most studies have focused on three main varieties – reishi, maitake and shiitake. Reishi, otherwise known as ganoderma, has been used in Chinese medicine for 2,000 years and numerous studies have investigated its much-vaunted anti-cancer and immune-boosting properties. In a paper published last year in the US's Proceedings of the National Academy of Sciences (PNAS) journal, a team of scientists linked its use to cancer-cell death. The team, from the Taiwanese research centre Academia Sinica, found that F3 polysaccharides, a type of carbohydrate molecule found in reishi mushrooms, can induce antibodies to recognise and kill antigens associated with tumours or cancer cells. Maitake mushrooms are believed to have similar qualities. In a human trial, conducted by Memorial Sloan–Kettering Cancer Centre in 2009, maitake was shown to stimulate the immune systems of breast cancer patients. Laboratory in vitro research by Sensuke Konno, associate professor of urology at New York Medical College, found that non-toxic concentrations of the GD or PL "fractions" found in maitake mushrooms, when combined with vitamin C, not only reduced growth of bladder cancer cells by 90% in 72 hours, but were also highly effective in killing them. But perhaps the best known of all the medicinal mushrooms is the shiitake. Not only is it a delicious ingredient, but it is also famed for its compound lentinan. Several papers have found the polysaccharide could help increase the survival rate of cancer patients, including research carried out by a team of scientists at Harbin University, China, in 2008, which found that lentinan was "beneficial in terms of increasing mean survival duration, tumour necrosis and reducing the recurrence rate". The shiitake extract Active Hexose Correlated Compound (AHCC) is the second most popular form of alternative medicine used by cancer patients in Japan – Agaricus subrufescens, another mushroom, is the first. A study in 2011 by researchers in Texas found that AHCC may also be effective in protecting the body against viruses and infections, including flu. But while polysaccharide-K – a protein extract from the trametes versicolor fungus, or turkey tail – is already being used to boost the immune system of cancer patients in some countries including Japan, research into all fungi is still in its infancy and more trials are needed. And before you start making a shiitake stir-fry one of your five a day, Dr Kat Arney of Cancer Research UK warns against jumping to conclusions based on evidence gathered using laboratory experiments. The problem, she explains, is that lots of things can kill cells in a lab, not just mushroom extracts. Whether it is bleach or leaving the incubator door open, there may be many reasons for the positive results. It doesn't mean they are all treatments for cancer. "When it's something like food, people get really excited and say: 'Does it mean if I eat enough of these things, it will have this effect on me?' she says. "It doesn't really work that way because you don't know about the dose, you don't know whether by eating something it's bio-available – meaning it can get from the inside of your tummy into your bloodstream and into the tumour in a dose that's actually relevant. That's the trouble." Eating too many mushrooms could even damage your health because of fungi's complex mixture of chemicals. Arney adds: "When people start eating loads and loads of one thing, it's not necessarily entirely benign." Claims by Russian scientists that the chaga mushroom, a type of fungi that grows on birch trees, can help treat patients with HIV, should also be approached with caution. The researchers at the Vector Institute in Siberia stated in 2013 that the chaga had the potential to be developed into an antiviral medicine that could protect against the virus, as well as flu and smallpox. But the UK's National Aids Trust remains sceptical. Yusef Azad, director of policy and campaigns, says the institute's bold claims could give false hope and distract from the real issues around HIV. Of course, a lot of useful drugs are originally derived from natural products such as plants – aspirin is the classic example, while the chemotherapy drug taxol comes from the yew tree. The key thing, Arney says, is to find out what the useful chemicals are in these fungi. But until extensive clinical trials are run, the tangible benefits of using medicinal mushrooms to protect against and treat disease remain unknown. As Arney says: "Mushrooms are more like a treasure chest that needs to be opened, rather than the cure for cancer."